Gesine Stephan (born in 1965) studied economics at the University of Hanover until 1990. She then worked as a research associate and, after completing her doctoral degree in 1994, as a research fellow at the Institute of Quantitative Economic Research at the University of Hanover, where she went on to work as a senior research fellow after completing her habilitation in 2000. She spent research periods at the universities in Austin and Berkeley, USA, in 1996 and 1997. In 2000, she was a visiting professor of service economics and policy at the University of Trier. 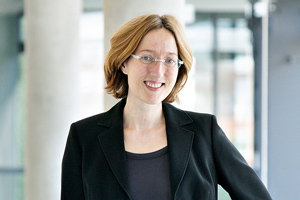 She has been head of the research unit ‘Active Labor Market Policies and Integration’ at the Institute for Employment Research (IAB) of the Federal Employment Agency in Nuremberg since April 2004. Professor Stephan was appointed to the newly established Chair of Empirical Microeconomics at the School of Business and Economics in May 2009. At the IAB she continues to lead the research unit ‘Active Labor Market Policy and Integration’, which focuses on the analysis and evaluation of instruments and programs in labor market policy. Professor Stephan’s research priorities are labor and personnel economics, labor and social policy, microeconometrics, and evaluation of labor market policies.